In May of 2013, the Wisconsin Main Street program conducted a three day analysis of Omro, in the findings was a facade rendering of the Masonic Temple with the upper windows opened and bricks removed. In October of 2013, John and Melanie Steen, residents of Omro and members of the Omro Area Historical Society and Future Omro Chamber-Main Street, began raising funds to restore the City of Omro's Old City Hall Clock Tower and the Masonic Temple windows. Project Scope: To request area artisans, community members, businesses and local organizations to create pieces of artwork utilizing the bricks which were taken from the original Masonic Temples bricks which closed in the window openings for decades. Then feature the one-of-a-kind artistic pieces during silent auctions in order to complete the funding needed for the window restoration projects. To bring a community based art project for residents of all ages. To feature the newly remodeled windows and offer tours of the Omro Area Historical Society and City of Omro's historical collection, as well as the Masonic Temple Lodge in the second level. Showcase local businesses such as the Cheese House, Rushford Meadery and Winery, and Pur Class Vodka. Funding Goals: Both window restoration projects totaling $78,500 with an outstanding balance of $2,500 required to complete the projects. When: Requests were submitted to local artists, businesses, organizations, students, and area media in early July of 2015. A list of distributed bricks was created for tracking purposes. Posters and flyers were distributed for the event which took place on Thursday, October 1st, 2015 from 6-8pm at the Masonic Temple. Several weeks prior to the event direct over-sized postcards were mailed to over one thousand businesses and residences. A press release was submitted to area television, radio and newspapers. Conclusion: Through this community project over 100 bricks were on display to the public and $3,300 in funding was achieved. 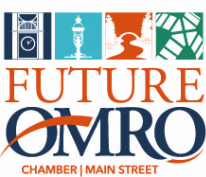 Thanks to the collaborative efforts of multiple organizations, area businesses and the greater Omro community the city's original 1896 clock tower and the 1892 Masonic Temple continue to be icons for future generations to come in Omro.